Eberhard Karls University of Tübingen (German: Eberhard Karls Universität Tübingen, sometimes called the "Eberhardina Carolina") is a public university located in the city of Tübingen, Baden-Württemberg, Germany. 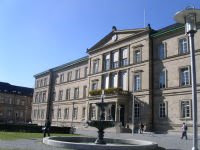 It is one of Germany's oldest universities, internationally noted in medicine, natural sciences and the humanities. Especially German Studies (German: Germanistik) has been ranked first of all German universities for many years. Tübingen is one of five classical "university towns" in Germany; the other four being Marburg, Göttingen, Freiburg and Heidelberg. The university has many Nobel laureate alumni, especially in the fields of medicine and chemistry. Currently, about 24,000 students are enrolled. The 17 hospitals in Tübingen affiliated with the university's faculty of medicine have 1,500 patient beds, and cater to 66,000 in-patients and 200,000 out-patients on an annual basis. The university has a history of innovative thought, particularly in theology. Philipp Melanchthon (1497–1560), prime mover in building the German school system and a chief figure in the Protestant Reformation, helped establish its direction. Among Tübingen’s eminent students have been astronomer Johannes Kepler, poet Friedrich Hölderlin, and philosophers Friedrich Schelling and G.W.F. Hegel. 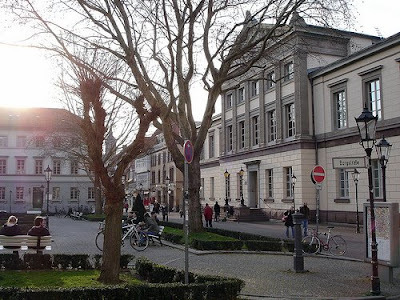 The university rose to its height of prominence in the middle of the 19th century with the teachings of poet and civic leader Ludwig Uhland and the Protestant theologian Ferdinand Christian Baur, whose beliefs and disciples became known as the “Tübingen School.” The University of Tübingen also was the first German university to establish a faculty of natural sciences, in 1863. In the 20th century, Tübingen became dominated first by Marxist-Leninist philosophy and then by Adolf Hitler’s Nazi regime until the beginning of the Allied occupation in 1945. 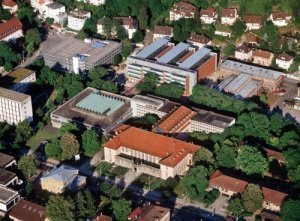 In 1970 the university was restructured into a series of independent departments of study and research after the manner of French universities. The university is made up of 14 faculties, some of which are subdivided into further departments. The University of Tübingen is undertaking a broad range of research projects in various fields. The most prominent ones are to be found among the natural sciences. The Hertie Institute for Clinical Brain Research, for instance, focuses on general, cognitive and cellular neurology as well as neurodegeneration. The Centre for Interdisciplinary Clinical Research deals primarily with cell biology in diagnostics and therapy of organ system diseases.